Musings of a Literary Wanderer: 5 Reasons Why You'll Love "This Could Change Everything"
5 Reasons Why You'll Love "This Could Change Everything"
While drunk one night, Essie decides to write one of those Christmas brag letters - except instead of writing about all the fun things she did during the year, she lets loose a rant that somehow then gets forwarded to all of her email contacts. Since the rant was about her boss, who just happens to be her boyfriend's mother, she loses her job, relationship, and home in one fell swoop. This Could Change Everything follows Essie as she tries to start over, with the help of her best friend Scarlet and some new acquaintances. Here are five reasons why I think you'll enjoy this book! 1. Zillah. Zillah is Essie's landlady at her new home. At 83, Zillah is still going strong - she loves people, loves going out, and dresses to the nines. She was so upbeat and charming! I think my favorite thing about her was her project to grant wishes for other elderly people, kind of like Make-A-Wish but for adults. I teared up each time she created a magical memory for someone who didn't have a lot of time left. 2. The romances. I have to admit, romance is not necessarily something I seek out in books, but there were a couple in this book that were just so sweet. Even though it was obvious from the beginning who would end up with who, I liked the routes they took to get there. Mansell plays with the idea that a relationship that seems perfect on paper may not actually be one's destiny. 3. The writing. I love Mansell's writing - it is comfortable and easy-to-read. For me, her signature is introducing a bunch of characters and then having them come together in some twist of fate. 4. The character development. I typically like plot-driven books more than character-driven ones, but I actually enjoyed that there was less action in this book. I loved getting to know the characters and watching their journeys. Even though Essie is the main character, the supporting characters played roles that were just as large. Each had hidden layers that were slowly peeled back, revealing more depth. I think you'll love finding out about Scarlet's hidden talents and learning why Conor (Essie's neighbor) quit a successful career as a lawyer. 5. The ending. Minor spoiler - if you enjoy a "happily-ever-after," this is the book for you. At the time I read this book, I really needed something happy and charming and cozy, and this hit the spot. Was it predictable? Yes. Did I care? No. I love the sound of Zillah! A charming, upbeat old lady...yes please! She seems like a lot of fun. Great twist on a typical review format, Angela! Thanks, Amy! Zillah was awesome! 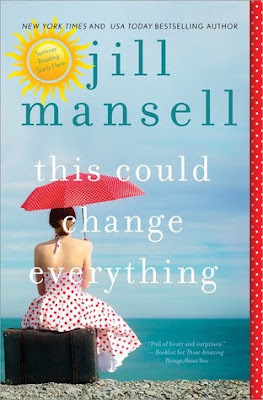 I adore Jill Mansell - the perfect reads when you need something fun and happy! Oh! I'll have to check this one out!! This sounds pretty good! Especially Zillah sounds like a really fun character to read about. This sounds so cute! I do love a good happily ever after every now and then. Thanks for sharing! Exactly! I don't always go for a HEA, but I really needed it! It came at the perfect time! I am all for a HEA :) And oh Essie, the poor thing! Sending an the wrong email to all my conacts is something I'm always afraid of! Right?? Well, you'll have to read the story to find out what really happens! This sounds lovely. I've never read one of Jill Mansell's books but I could see myself enjoying this one, especially for Zillah. I love Jill Mansell's books. They are lovely and charming, with just a bit of quirk! I love good character development. This sounds like a lovely book. I haven't read anything by this author but want to give this one a chance! I hope you enjoy it, Mary! I have never read Jill Mansell, but she's been on my radar for a long time. I enjoy character-driven books, and much prefer a HEA. I think I'll put this on my TBR list. Good review! Awesome! Thanks, Lark, I hope you enjoy it! Aww, this one sounds so sweet. I'm also generally a plot driven reader, but this sounds like it has all the makings of something I could really enjoy. The depth to the characters sounds amazing and Zillah sounds like a hoot! And someone we could aspire to be like when we 'grow up'. Exactly! I want to be just like Zillah! Check Out Literary Book Gifts!